Twenty acres (8 hectares) were purchased by the University in 1854 with four of these acres being designated as the site for the University Museum, which was built between 1855 and 1860. Over the following five years a further 72 acres (29 hectares) towards the River Cherwell were bought together with the four acre (1.5 hectare) spur towards King's Mill, on which Mesopotamia Walk was laid out in 1865. The landscape in the the 1800s looked very different from today. The meadow land adjacent to the river provided grazing for sheep and cattle (this continued until 1937) and farmland surrounded the Museum. 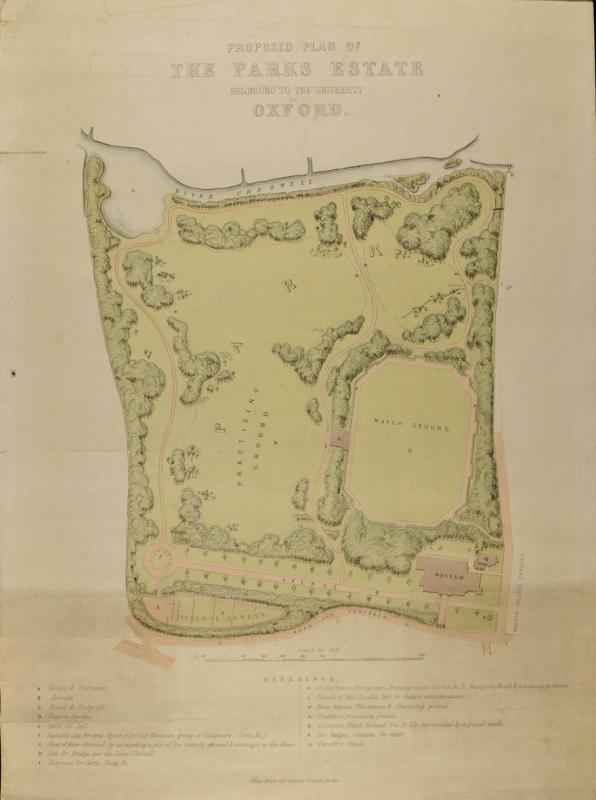 Construction of Keble College opposite the Parks did not begin until 1868 and Lady Margaret Hall was founded in 1878. It is possible that the only trees growing here when the land was purchased were the 190 willows, 59 elms and the one oak and one poplar which are recorded in the surveyor's report. The University Parks now boast over 1,600 trees, made up of over 250 species and varieties, several of which are vulnerable or endangered in the wild.